Chuck Berry is the father of rock guitar. Though the elements were in the air, no one before him had hit upon the formula that put it all together – boogie-woogie piano style, jump blues rhythms, and Chicago-based elec­tric guitarwork – or packaged it so neatly. Berry’s accomplishments are now imbedded in the core of rock music. Anyone picking up a guitar post-1955 has been influenced by him, directly or indirectly, and that includes the Beatles, Stones, the Who, Yardbirds, Jimi Hendrix, Angus Young, Ed Van Halen, or the latest kid on the block. Chuck was “discov­ered” and brought to Chess records in 1953 by none other than Muddy Waters himself, the Father of Electric Blues. Between the two, you have the essential DNA for practically all rock music to follow – but that’s another story. Today’s story is No Particular Place to Go, one of Berry’s biggest hits (No. 10 in 1964), a career-defining statement, and an immortal piece of the rock guitar legacy. Chuck Berry’s roots are clearly in the blues, which is one reason why 90%, or more, of rock music is still blues-based in some way. Take a look at the overall song form of No Particular Place to Go. The verses and solos make use of the classic 12-bar blues progres­sion in G. As with many of Chuck’s tunes, the form is streamlined in the verses. 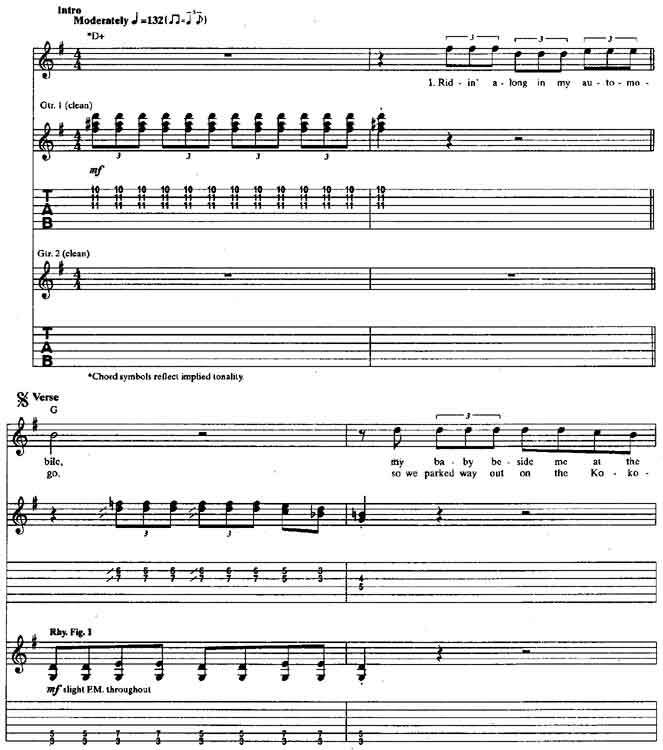 There is no “quick IV” (move to C, the IV chord, in the second measure), no turnaround, and mea­sures 9 and 10 use only D, the V chord, instead of the D-C change (V-IV). Berry saves those for the solos. Similarly, we only find a turnaround in the last two measures of the song. There, Chuck repackages a simplified version of the “Sweet Home Chicago” cadence as a thoroughly blues-approved ending figure. The verses are propelled by Rhy. Fig. 1, a signature shuffling Chuck Berry rhythm groove. Fusing elements of boogie-woogie piano accompaniment and older blues guitar chording, Chuck “invented” this comping pat­tern in the early 50s, and it has been a vital piece of rock rhythm guitar ever since – seized by virtually very guitar-led rock band in exis­tence from the Beatles and the Stones to Aerosmith, Van Halen, Kiss, and AC/DC. In this arrangement, the comping is played by Gtr. 2, the backing chord part. Note the trade­mark 5th to 6th pattern [Fig. 2] in every chord of the song. Chuck’s three 12-bar solo choruses in No Particular Place to Go split the difference between chord and melody style. Constructed almost exclusively of double stops and triads, the solos are based on rhythm and motivated by fierce, predominantly eighth-note strum­ming. The idea of grabbing a couple of strings and transforming them into pure rock energy is a concept Chuck made his own. And if guitar licks could be copyrighted, virtually every major guitarist of the last 30 years would have to get in line to pay Berry a royalty – Jimi Hendrix, Scotty Moore, John Lennon, Jimmy Page, Angus Young, Keith Richard, Eric Clapton, Ed Van Halen, and Stevie Ray Vaughan among them. Chuck’s three solos con­tain almost every variant of the “Chuck Berry lick.” Let’s take a closer look. He begins both solo sections by slurring into a G major triad [Fig. 3]. This shape, or parts of it, is used throughout the solos: at the 15th and 3rd positions for G and in the 8th position for C. Notice that in the first solo, the shape is played in С as a dyad (two-note chord) on the 2nd and 3rd strings. This sets up a dyad pro­gression in parallel 3rds which moves down the neck diatonically to create a quasi-Mexican sound, and is another familiar Berryism found in countless solos. The bluesy double stops in measures 8-10 are another staple of Chuck’s style and are found in all three solo choruses. Notice that the phrase is centered around the same triad shape in G and that the upper portion of it is slid up three frets to produce a blues-inflected 7th sound [Fig. 4]. Along similar lines, Berry keeps things interesting throughout the solos by incorporating notes from the G blues scale (G-Bb-C-Db-D-F) and the G Mixolydian mode (G-A-B-C-D-E-F) into the phrases as double stops. These fingerings are most often simple but effective partial-barre chords [Fig. 5]. The bent double stop lick found at the end of both solo sections is another transplanted blues sound which became a rockabilly, and ultimately a rock ‘n’ roll, guitar cliche. It is made of a tritone (b5 interval) dyad [Fig. 6], and is bent up, not quite a half step, for a par­ticularly nasty effect. It’s a part of Chuck Berry No Particular Place To Go guitar lesson.